I’ve got a friend who owns a bakery. She makes these wonderful dessert bites – little hors d’oeuvres that seem like they should be on display rather than eaten. I have neither the skill nor the patience for that. My desserts lean heavily towards the rustic. It doesn’t mean they are any less flavorful. But they are definitely meant to be eaten, not admired for their artistic quality. Galettes and crostadas fall nicely into this category. I’m not sure exactly what the difference is (other than French and Italian origins). Honestly, the way I look at it: if it has Italian influences, then it’s a crostada; otherwise it’s a galette. (If you have any idea and I’m completely wrong, let me know). Mangos and blueberries are in abundant supply right now. The local mega mart has blueberries for $1.50 a pint and mangos for 65 cents apiece. Who can pass that up? The blueberries, even though they’re the big cultivated kind, are pretty flavorful this year (nothing compares to those tiny little azure orbs that grow wild, does it?). Somewhere in the past I’ve had something that combined mangoes and blueberries, but for the life of me, I cannot recall where or when. Maybe it was ice cream (who knows?). But I thought I’d try pairing the two in a pie. Like I said, the blueberries seem to be bursting with flavor this year, and the mild acidity of the mangoes compliments the jamminess of the berries. My only regret is that I didn’t have any cream (either whipped or ice) in the house to go with it. The crust is flaky and delicate – almost too delicate, but not quite. It definitely needs to cool completely before you try to cut it. If the juice runs out during the baking process, you should probably use a large spatula and loosen it from the parchment before it sets up completely. This is one of those things that tastes even better when it sits overnight, but I’m not suggesting you make that a regular habit. If I don’t have the patience for fine details, I certainly don’t have time to wait around overnight for flavors to meld (even though I ought to). I’m surprised we had any that lasted into the second day in order to find out. So take some time and enjoy the great flavors of the season. Maybe next time I should avoid the confusion and just make this in a dish and call it a pie instead – or is that a cobbler? Whatever you call it, it tastes like summer in Florida. Dump flour sugar, salt and lemon zest into the bowl of a food processor. Pulse just to combine. Add butter and pulse until the consistency of coarse sand. With blade turning, slowly add ice water until it forms a ball. Depending on the weather, you may need to add more or less. Wrap dough in plastic wrap, form into a disc, and chill for one hour. In a large mixing bowl, combine blueberries, mango, salt, sugar, flour, cinnamon, and lemon zest. Toss until all fruit is coated and set aside. Roll out dough on a floured surface to approximately 12” circle. Transfer to parchment lined baking sheet (Make sure baking sheet has a lip to catch any fruit juice that may leak during baking). Pour filling into the middle of dough. Spread evenly, leaving about 1-2” around the edge. Fold edges of dough over filling, forming a rough circle and gently pressing to seal dough around filling. Whisk egg and water together in a small bowl. Brush pastry dough with egg wash and sprinkle with sugar. this post is reblogged from my earlier site, ‘Inexpensive Eating’. 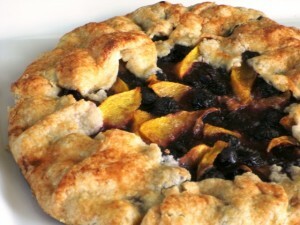 This entry was posted in Cooking and tagged dessert, fruit. Bookmark the permalink.